This is "Harry Potter and the Philosopher's Stone", the first one in the Harry Potter series. It was translated by Marina Astrologo and illustrated by Serena Riglietti. The book was bought in a temporary book market in Piazza Navona, Rome, Italy on the 17th October 2005. 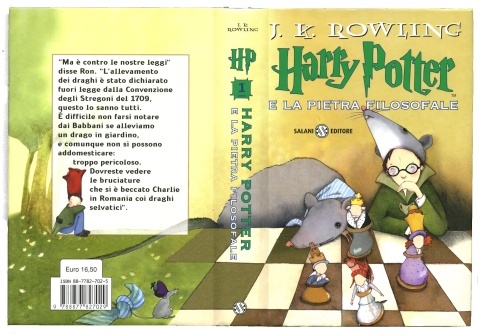 This hard back version, has a large mouse sitting next to Harry Potter, and Harry is wearing a hat in the shape of mouse. There is an obvious chess board theme on the front too. On the back cover there is another mouse, with a hat on its head and a scarf tied around its tail. There's also a boy who I assume is Harry, but has a strange looking large red hat on. If anyone understands the significance of these mice - please let me know! Harry Potter a la Pietra Filosofale, illustration by Serena Riglietti, translated by Marina Astrologo.